Freiheit und Bulla des allerheiligsten in Gott vatters und Herren, Herren Pii, des namens fünfften Bapsts, uber die Erhoehung und Schoepffung des durchleüchtigsten Fürsten und Herren, Herren Cosmi Medices, Hertzogen zu Florentz, &c. Zu einem Groszhertzoge und koenigmässigem, der provintz Ethrurien, ime underworffen. Geschehen zu Rom, den 27. Augusti. Anno M.D. LXIX. [Germany], 1570. Small 4to (20 x 15 cm). With a woodcut figure of the Pope on the title-page. Set in Schwabacher gothic type with fraktur headings and incidental roman. Half maroon goatskin morocco (1930s? 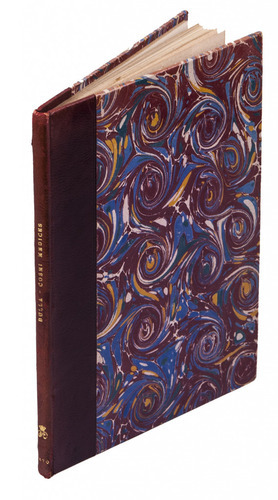 ), gold-tooled spine. 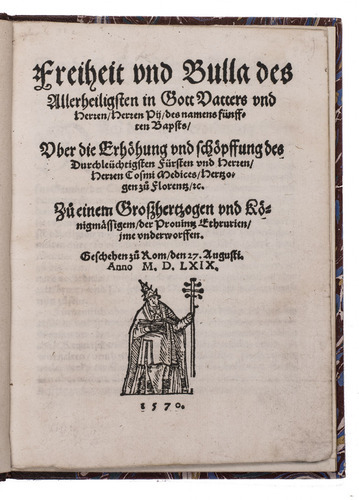 Rare German translation (one of two editions, both dated 1570) of Pope Pius V's Latin papal bull elevating Cosimo I de' Medici, already Duke of Florence, to become the first Grand Duke of Tuscany on 27 August 1569. A descendent of the founder of the great Medici banking family and of the Sforza Dukes of Milan, Cosimo I brought the Medici's to the pinnacle of power with his elevation to Grand Duke and remains famous for both his political ruthlessness and his patronage of the arts. 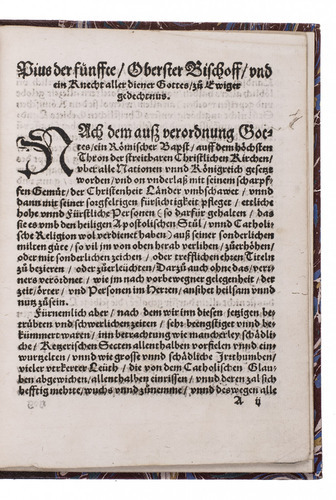 The Herzog August Bibliothek attributes the other edition to the Heidelberg printer Johann Mayer, but the present edition was produced by a different printer. The present copy was bound for Prince Piero Ginori Conti (1865-1939), with his armorial bookplate and his monogram on the spine, and like much material from his library it was acquired by Giannalisa Feltrinelli (ca. 1903-1981) in Rome. Very slightly browned and with a tiny marginal worm trail in 2 leaves, but still in very good condition. Binding slightly worn at the corners but also very good. KVK & WorldCat (3 or 4 copies); USTC 658234 (1 copy); VD16, K482 (2 copies); not in Adams; BMC STC German.